The New Zealand Railways Magazine was published monthly until June 1940. Based on British and American railway company magazines, it was originally intended as a journal for the Railways Department’s 18,000 staff and their major customers. 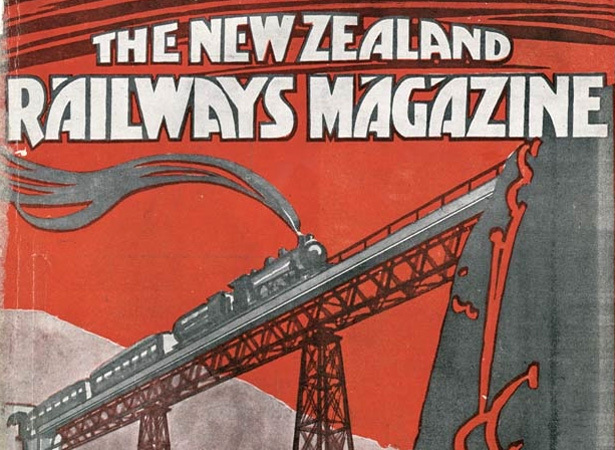 Alongside railway news and technical articles from New Zealand and overseas, the magazine promoted domestic tourism through travel stories, photo spreads, advertisements and accommodation listings. It soon expanded to include New Zealand verse, short fiction, humour, sports news, historical yarns, biographical sketches and book reviews. The journalist James Cowan was the magazine’s most prolific contributor, writing more than 120 historical and travel features, including 48 sketches of ‘Famous New Zealanders’. In 1935–6 the writer Robin Hyde produced a lively travel series, ‘On the Road to Anywhere: Adventures of a Train Tramp’. Other contributors included Pat Lawlor (who wrote a regular ‘Among the Books’ column under the pseudonym ‘Shibli Bagarag’), Margaret MacPherson, Alan Mulgan and Denis Glover. In 1927 the magazine introduced a regular column ‘Of Feminine Interest’ (later entitled ‘Our Women’s Section’) featuring recipes, fashion tips, society gossip and notes on children’s health. As well as catering for the small number of female staff (85 at that time), New Zealand Railways hoped that the wives and daughters of the 12,000 married railwaymen would ‘appreciate the regular appearance of a page devoted to feminine and household matters’. In 1933, apparently at the urging of Lawlor, the Railways Magazine further widened its brief to become a general-interest monthly for all New Zealanders. In the mid-1930s its circulation reached 26,000. The Railways Magazine survived the Depression but closed suddenly in June 1940 – a victim of wartime economies, paper shortages and the imminent retirement of founding editor G.G. Stewart. During the inter-war years no other monthly magazine had matched its commitment to promoting a popular literary culture in New Zealand. We have 5 biographies, 10 articles, related to New Zealand Railways Magazine launched.